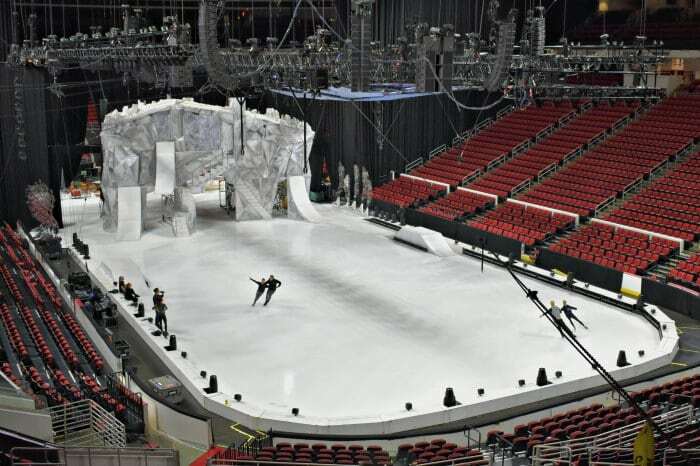 Take a look behind the scenes of the Cirque du Soleil CRYSTAL rehearsal at PNC Arena in Raleigh. I am so impressed with this production from the wigs to the costumes and of course the performers. We’re looking at it all. 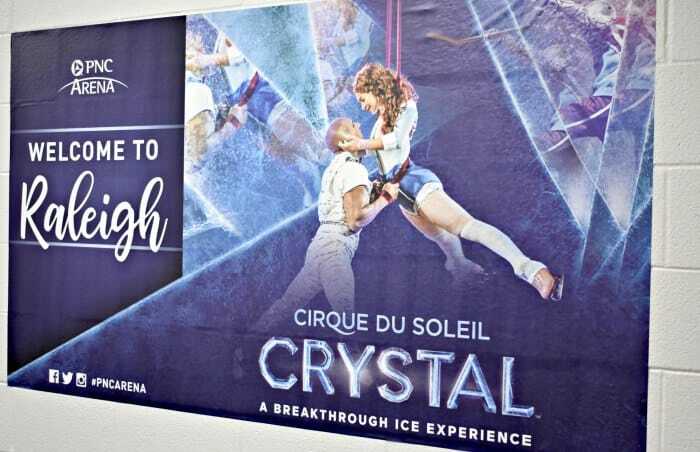 CRYSTAL is Cirque du Soleil’s 42nd creation and adds the element of ice to their already amazing lineup. This show is the first of its kind so they had to bring in ice skaters with little acrobatic experience as well as train acrobats to move on ice. Talk about skill! The set is a simple backdrop with fewer props (still over 100) to give way for projections to shine and add color and dimension to the show. Even the costumes have lighting sensors to coordinate with the projections. No detail was left unfinished. During my visit to the Cirque du Soleil CRYSTAL rehearsal, I had the chance to speak with Touring Publicist, Julie Desmarais and I am so excited to share everything I learned about this amazing show. Seeing how much work goes into each and every performance from the music to the costumes to the skill was incredible. Every single person has an important role from the star of the show to the wig designer. If you plan to attend, there really isn’t a bad seat in the house. The show is setup like a horseshoe so everyone has a good view of the performance. And the best part about a Cirque show is that there isn’t a wrong way to watch. Every angle offers something cool to see. 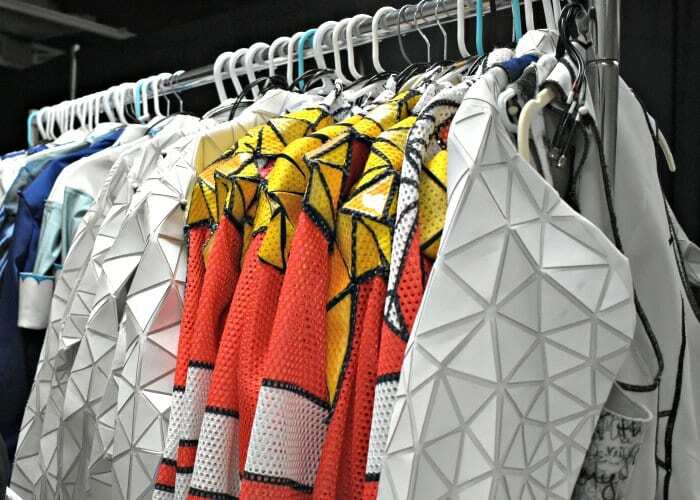 So much detail goes into the costuming for CRYSTAL and it was very cool to see up close. There are 17 semi trucks that travel with the show full of props and costuming for the 43 performers and crew. Each performer has 3-4 costume changes per show with the fastest change clocking in at under one minute. Can you imagine not only changing that fast but also being ready to run or skate right back into the show? Makeup takes about an hour to apply before the show and performers do their own makeup. I loved these colorful wigs on display! 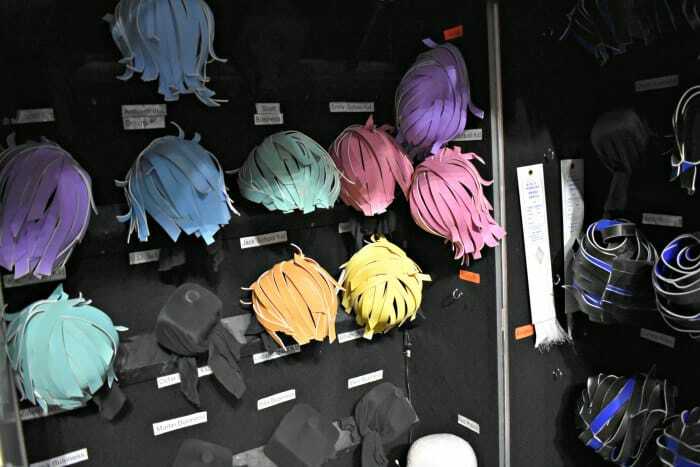 Wigs are styled and maintained by a specialist who travels with the show as well. Speaking of skates, the costume designers had to get creative when it came to costume changes. 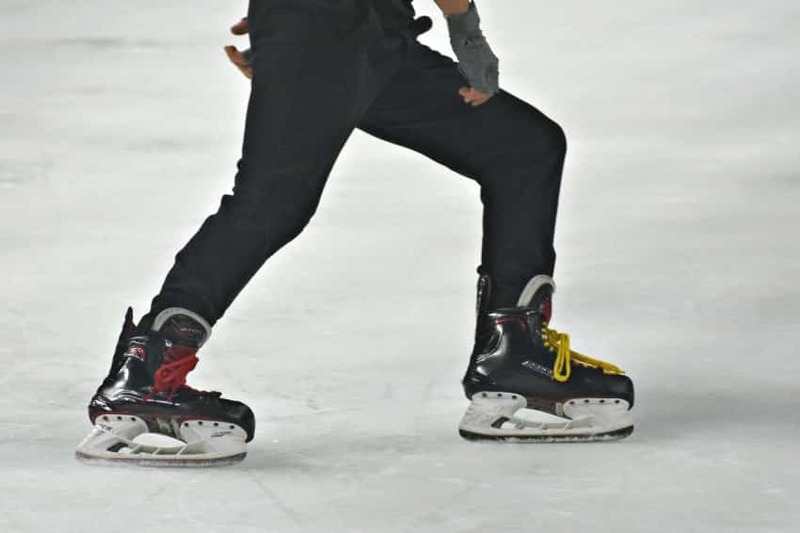 So they developed special pants with several openings that could be changed without taking the skates off for quick removal. They also have custom shoes for those performers who aren’t on skates. 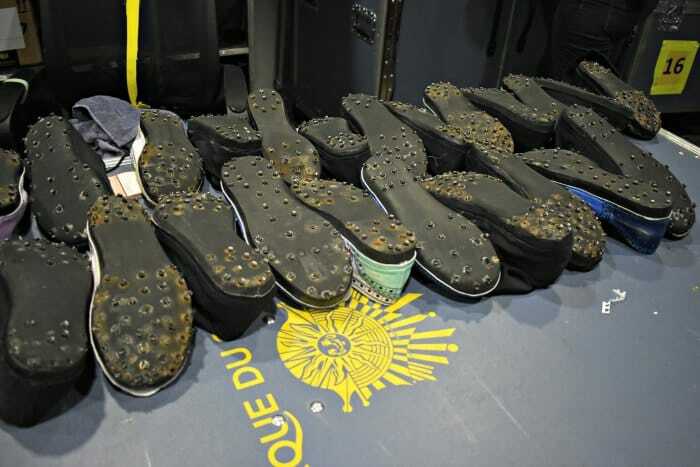 They are fitted with spikes so performers can safely move around on the ice. And yes, there is even a designated person to check and repair these shoes before every show. During our visit we had the pleasure of watching the performers as they rehearsed. Depending on the day, rehearsals vary in length. On a show day, warm ups on the ice typically run for 15-30 minutes for pair skaters, then solo skaters. And while the skaters warm up, there is another area for the acrobats to practice their fancy moves. I mean y’all they were just over there all upside-down and whatnot like it was nothing. It was so amazing to see them up close and witness how crazy strong they all are. The Raleigh, NC performance of Cirque du Soleil CRYSTAL is the 37th city stop since the show began in 2017. And so far they have performed over 230 shows! When I was there this week, I shot some video of our experience. Check it out to see these awesome people in motion! 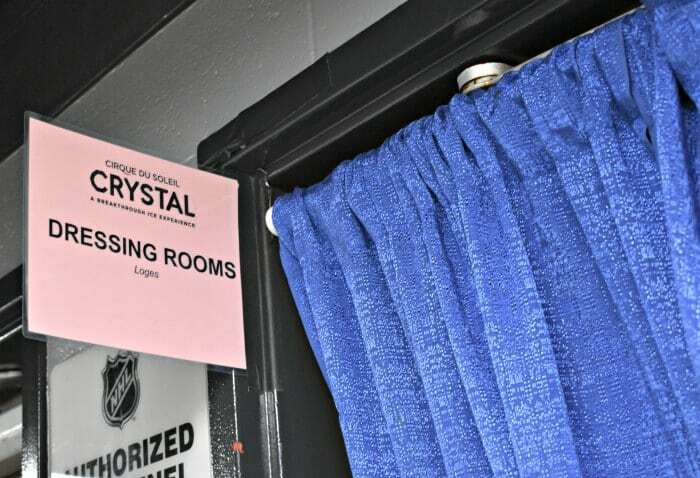 Because CRYSTAL is a complete departure from past Cirque du Soleil shows, there are a few things they had to work around. For instance, all of the ice skaters are completely new to Cirque just for this show. This means they had little acrobatic training prior to the show, which makes their performance that much more amazing if you ask me. Performers also rotate roles from time to time. In fact, there are several different women who play Crystal so you never know who you will get! Finally, the score for CRYSTAL is another departure from past shows. Along with an original score, Cirque du Soleil incorporates four pop songs into the mix for the first time. You’ll hear versions of Chandelier, Halo, Sinnerman, and Beautiful Day in various portions of Crystal’s story. 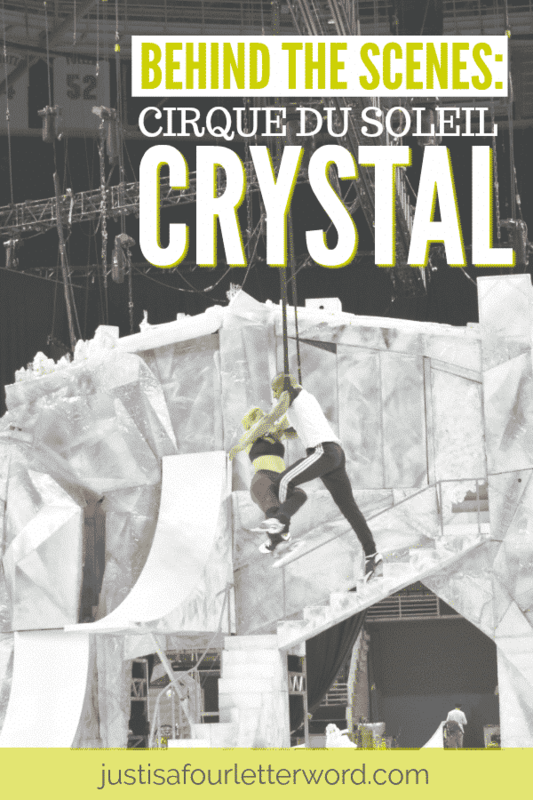 Cirque du Soleil CRYSTAL is in Raleigh through August 19th at the PNC Arena. Tickets start at $41 and can be purchased here. For other city stops, visit the Cirque du Soleil website. And if you see the show, I’d love to know what you think!